Remember when this momma of boys decorated a PINK room for one of my past posts for ScotchBlue? Well, as promised, I have the dresser makeover to share! The dresser started out brown and it seemed a bit heavy and dark for the newly painted space. I knew I wanted to paint it white to brighten it up and have it seem less bulky but I didn’t want it to be a boring old white dresser. So I decided to dress it up a bit! 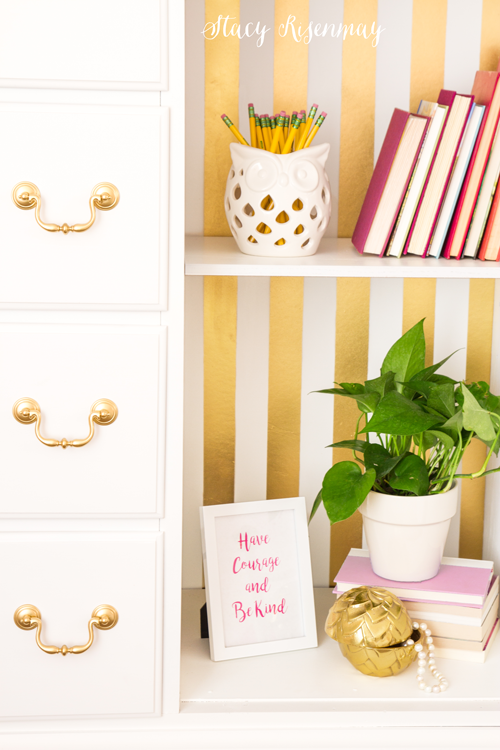 Since there were already gold accents in the space, it seemed pretty obvious to add some gold to the dresser as well. The door was cracked in a place that I could not easily fix so I decided to not add it back onto the piece. That was okay though because it would allow for some opening shelving and a way to add more color! Make sure to scroll down to the end so you can see it in the space! Remove hardware with a screwdriver and clean them really well in soapy water. 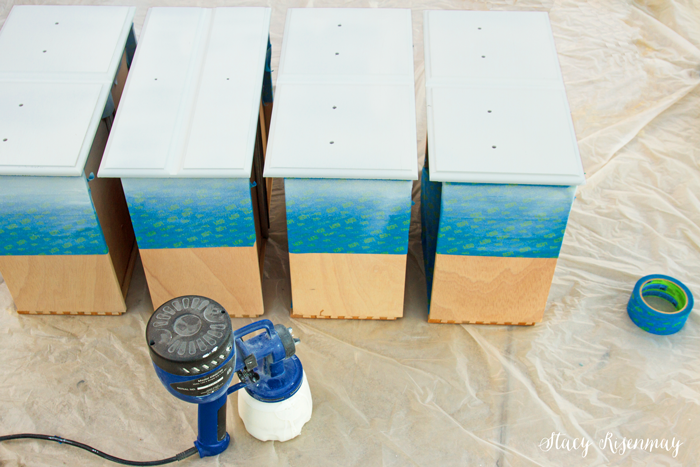 Once they are completely dry, spray paint them your color of choice. I lightly sanded the whole thing, sanding along the grain, using a soft grit sandpaper. 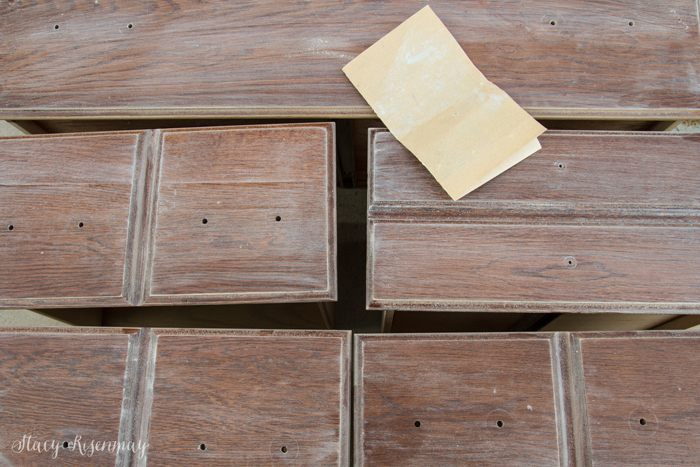 The surface needs to be roughed up a bit in order to allow the paint to grip properly. Wipe clean with a soapy rag when you are done. Now the really fun part. 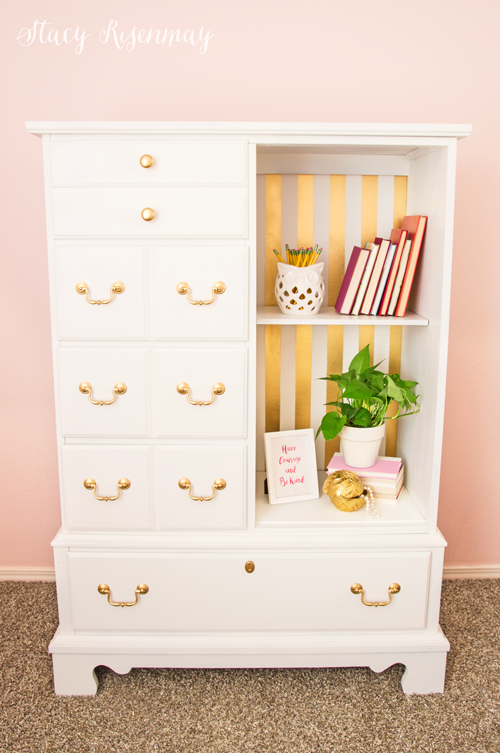 It is time to add some stripes to the back of the dresser! 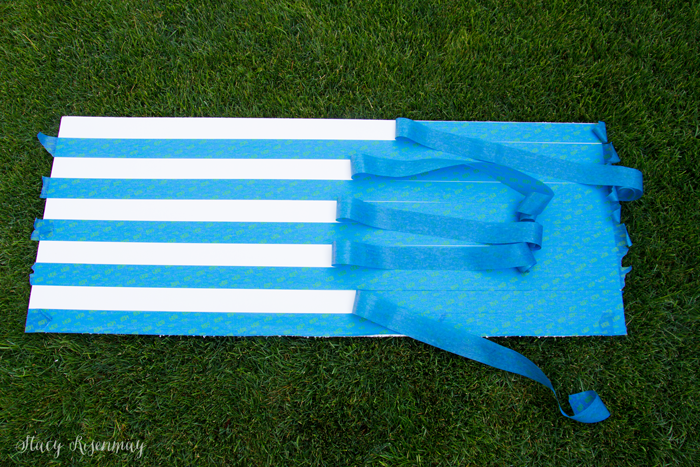 The easiest way to get even stripes without measuring is to tape the whole thing off and then remove every other strip of tape. 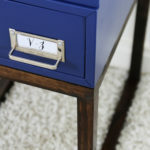 There are multiple widths of ScotchBlue tape so chose the width that works best for your project. Remember to wait 24 hours for the paint to dry before adhering painter’s tape. 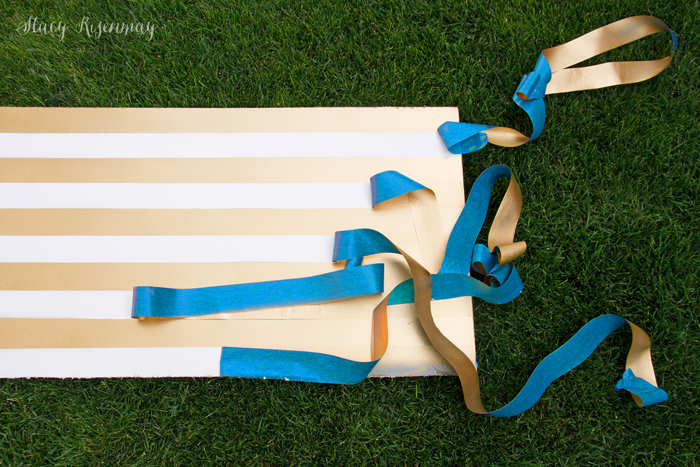 Paint the stripes gold or your color of choice then remove the tape by pulling it back on itself and away at a 45-degree angle. I used the same spray paint that I used for the hardware. Since spray paint is so thin, I made sure I didn’t spray too close to the board. Two thin coats is better than one thick one. 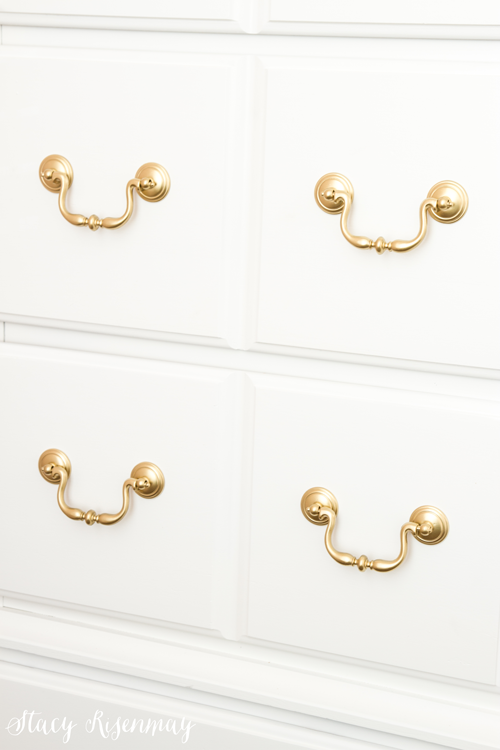 Reattach the back to the painted dresser using small nails or screws and put the hardware back on the drawers. I really have fallen in love with the whole white and gold combo. And here it is in the space! If you missed the room reveal you can see it HERE. What do you think about the door being removed? Should I have tried to fix it? 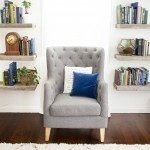 Or do you like the open shelves? This post was sponsored by ScotchBlue but the ideas and opinions were all mine. 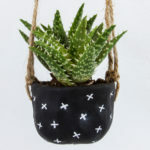 For more projects visit their inspiration hub! I love it just the way it is! It gives it more interest without the doors. You did a great job with it. I love how this piece was transformed. I would not have thought to remove the door…that is a genius. And gold stripes…perfect. Your tutorial is great…I also never thought to tape off the entire section and then remove strips for evenly spaced stripes. Very clever. I really do love this piece. Inspirational. Thanks for sharing! Beautifully done! I like it without the door. 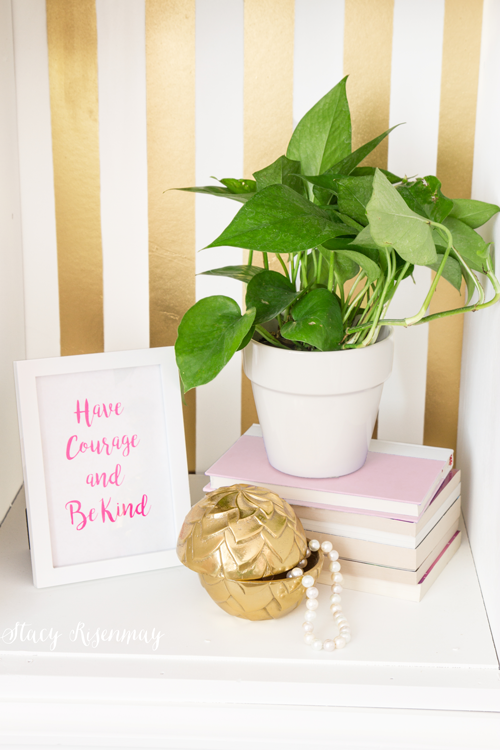 It makes the piece seem not soooo heavy and it adds a touch of elegance with the gold stripe. You couldn’t have done any better! Love the finished project! The finished project is perfect. Would not change a thing! I still am amazed it is the same piece of furniture! But now that I see your steps I have to believe my eyes! Leaving the door off is a stroke of brilliance as it changes the dynamics of the whole piece. But I cold never think of that! That’s why we NEED you Stacy!!! :-) Well executed design!!! Awesome job! I love it! I like the way you switched the drawers around too… and I’m also a fan of taking the door off. You have a great eye!….I’m sure I would have passed up the old dresser. 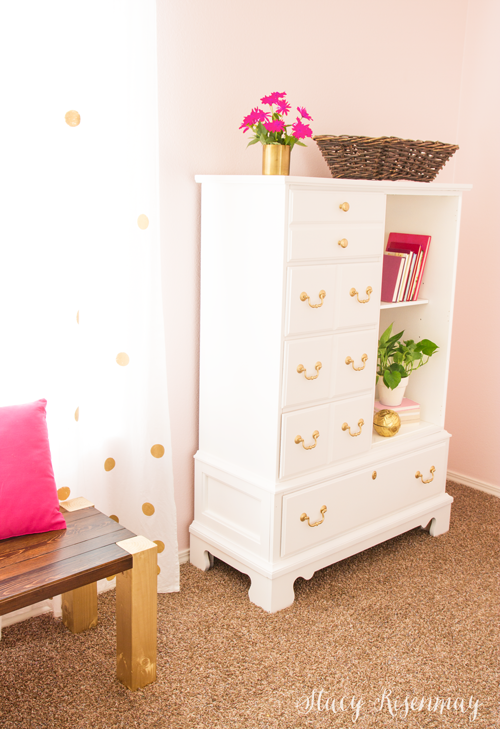 Oh WOW – this dresser turned out so beautiful! Love how bright it is and without it’s door. Thank you for sharing. That is beautiful! Lucky girl. 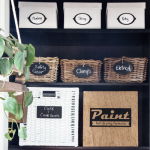 Very cute dresser redo. Love how it was just small accents of the gold, and I like the door left off of it! Very elegant and a beautiful job you did! So impressed! 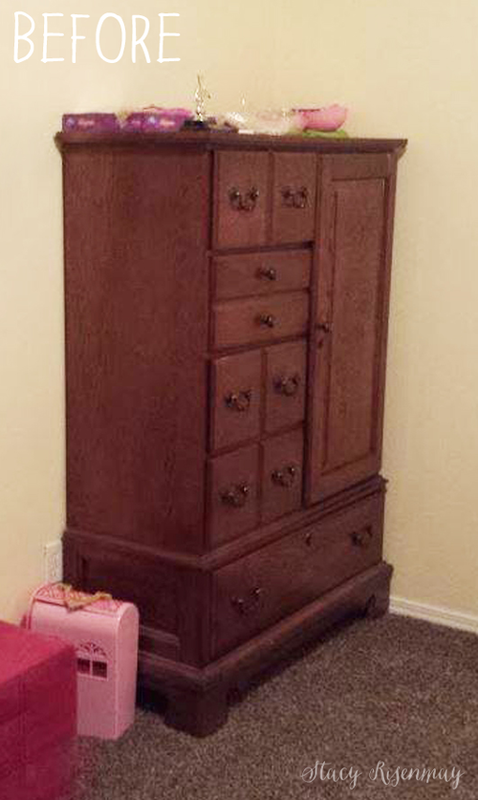 Your ideas and skills transformed this once plain dresser into a work of art. Amazing! 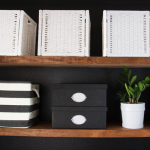 The shelves are a fantastic idea, and I love the gold stripes. Love the whole thing. I usually feel a bit sad when I see wood painted because I think the natural grain is usually nicer, but this looks fabulous painted, especially with the gold accessories. And with the gold polka dotted curtains, love the whole look. Sophisticated but fun. Inspiration to put things into their place. That’s beautiful! I have an old changing table with a side cabinet that I’ve been trying to figure out what to do with once we don’t need to change diapers any more. That open cabinet would be perfect. It looks so good on your dresser. This is absolutely beautiful! What an incredible difference! Thanks for linking up with Merry Monday this week. Ooh, so pretty. I love the gold. What brand did you use? 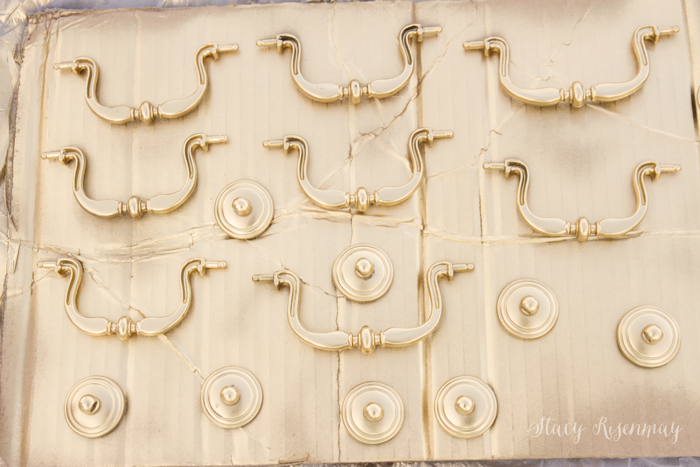 I recently spray painted some items gold but it was darker and much less metallic than I’d hoped.